The Shack presents a remarkable line up of live acoustic music, with a variety of artists on the first Saturday of each month. It is pleasantly laid out cabaret style in a candle lit atmosphere. The music is gently amplified with three main artists each month and one or two pre-booked floor spots. Complimentary tea and coffee is available and feel free to bring your own drinks and nibbles. Ken McArthur - Ken has been a keen guitarist for over 40years. In that time he has had the opportunity to perform many different styles at numerous venues throughout his profession. A particularly fond memory was a debut performance at "The Shack" when it was in Waterloo Street back in the 60s. He has passionately embraced his art by incorporating periods in his life involving acting, theatre, film & television. Inevitably, Ken would find himself gravitating back to his true love the guitar. Ken feels that he has been very lucky to have had the opportunity to perform with people of note, such as; James Blundell, Jimmy Little, Frankie J Holden, Sarah Mckenzie & many others. He currently performs in the "Ken McArthur Jazz Quartet", Port Macquarie swing outfit "The Black Magic Big Band", rock & rollers "The Greyhounds" & occasionally performs solo. 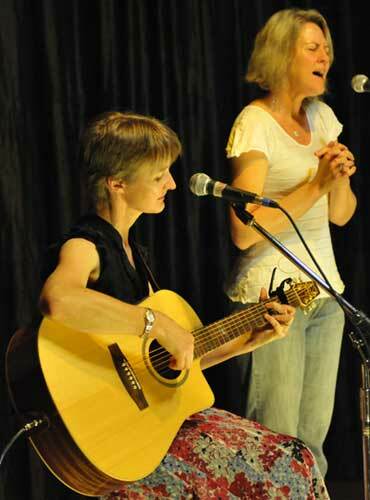 Sarah & Margie - Two wonderful singers, Sarah Fogarty and Margaret Salem have been performing as a duo for many years now. Their voices blend to produce amazing harmonies that are truly exquisite. To top it all off, their songs are sung straight from the heart. A rare treat indeed. Daddy Long Legs and the Swamp Donkeys - From the murky depths of the Lantana swamp, rises the smokey mud stained rhythms of the Swamp Donkeys. Riding astride the donkeys like a golf ball balanced on eight toothpicks, is the shaggy auburn vagabond known as Mr Daddy Long Legs. He can be heard growling his "Gut Butter Blues" throughout the urban forest. When these creatures of musical madness step together, the sound of their march is like an infusion of blues/roots/rambles. Their journey has taken them to various festivals and venues throughout the distant corners of Australia and into International waters. Once bitten by their muscular mating songs the venom spreads through your system with an addictive force causing its victim to dance like a possessed penguin performing its ritual fish dance. A musical experience that has to be seen to be believed. Jac-Yvonne - blends folk with re-verb soaked medieval pop. Jac Yvonne explodes in a Robin Hood like manner. Featured on JJJ’s Unearthed website, categorized as roots and rock and sounding like Bon Iver, Fleet Foxes, The Beach Boys. The Shack is held on the first Saturday of every month. There's a cover charge of $20 (or $15 for members, students and pensioners) to cover costs.